Q Safe parking is provided at the Base Camp after signing in at the Silwerfontein Farmhouse. Q Hikers could sleep over on Friday night at the Double Decker Bus Base Camp. 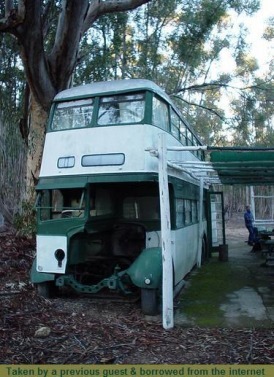 Q The bus sleeps 10 (bunk beds with mattresses). Q The cave could accommodate up to 25 people, who will sleep on a sandy bottom (own roll up mattresses must be carried up if so chosen). Q The bus has a gas braai, running water, outside shower (cold) and a flush toilet - no open fires allowed by the Bus Base Camp or in the cave. Q All water, food, bedding, etc. needs to be carried up to the cave for the duration of the stay. Q After good rains the rivers will be running and the water is drinkable and plentifull. Q All dirt generated needs to be removed from the cave and the trail and dumped in the dirt bin at the Base Camp. Q Along the trail is beautiful fynbos and proteas (Natural Heritage Site). Q At the cave is a long drop toilet. Q A guide can be booked for the hike, but you will definitely have the company of the dog Gouda to show you the way – she will gladly accept supper as payment. Day 1: The hike leads you from here through bluegum & pine forest, beautiful fynbos & shady kloofs. Hikers will pass through rugged rock formations & extensive protea savannah to the Saddle (604m). 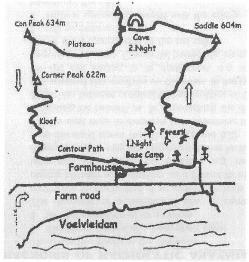 Now turn left (N) towards Ontongskop along the Wolseley flank of he ridge, passing a plateau before leading steeply up towards the peak. King proteas are to be found in this area. Then around a rocky edge to the cave (4hrs). Day 2: The trail leads from the cave 100m (N) towards Ontongskop (to the peak of the gully,) down the gully then turning right towards the mountain road, from where it proceeds (N), watch out for left turn away from the mountain road, over the plateau (protected Mountain Flora Reserve) to the Beacon Peak (622m) before descending sharp left (S) diagonally across fynbos slopes and kloofs at the contour path back to the Base Camp. QOpen fires strictly prohibited anywhere in the forest or along the hiking route. QPlease follow the trail markers which are placed along the entire trail route. QHikers on this trail have to be self-sufficient for water, food, sleeping and cooking equipment. QThis hiking trail requires a moderate level of fitness & experience in contending with summer heat & local weather conditions. QThis hike is undertaken entirely at the hiker’s own risk. Currently we do not have camping sites available, but we are in the planning phase to build/install some. If space is available though, we do offer the facilities at the bus to campers upon request, please contact us on info@silwerfontein.co.za. Due to the peace and quiet in the forest, this is a wonderfull experience to get away from it all, recharge ones batteries and fill your soul with natures bounty. Or for those who do not believe in that sort of twaddle..., a lekker place to hang and roar with your gabbas!